Given Richard’ failure to capture Jerusalem, his incarceration and his absence from England how could he still be called Lionheart rather than loser? How can he possibly deserve his statue outside the House of Commons? In this 2-part enquiry pupils look at why contemporary sources were so positive and why the Victorians loved him. The first part ask pupils to write a strong defence of Lionheart and then compare with the way Professor Gillingham is able to refute the criticisms of Richard in less than 100 words. Subscribers can request preview prior to full publication at the end of the month. 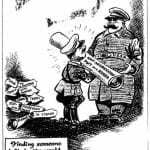 New GCSE lesson on Nazi-Soviet pact: how well do the cartoonists explain the paradox?